Please excuse the über-dumb title, but there aren't better words to describe my feelings. You're probably thinking that I'm going to write a post about this cherry pie. It's a logical assumption, but you're wrong. I'm writing about the magic of the 50mm lens. I borrowed my friend Maria's lens, put it on my D50, and turned to my right. 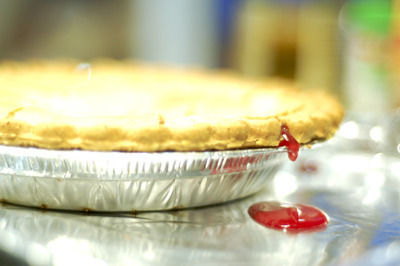 The cherry pie was glowing and it was the perfect first subject. I used to think a 50mm was a pain in the you-know-what, but I didn't realize the power that IS a 1.8 aperture. This is what gives you the shallow (and beautiful) depth of field. Focus is precise and everything else in the frame is knocked out of the park! Get your own here and fall in love with photography all over again. Check out Maggie Mason's photos from the Kirtsy Book Event for more inspiration!